Congratulations to Annette Newman on winning the inaugural Carlow County Snooker Championship recently at the Ivy Rooms and well done to Tara Byrne on reaching the final. Thanks to all the ladies for their support. In the meantime our County Federation will be holding a number of coaching sessions at the RILSA Academy Craanlusky during the months ahead, with the possibility of running a County League. RILSA are delighted to have the support and sponsorship of Carlow Local Sports Partnership as they provide a grant towards the promotion of cue sports in the County through the RILSA Carlow County Federation. This funding will go a long way in developing our juniors within our schools each year. The 2018 Carlow County Championship was yet another resounding success for RILSA. Congratulations to 11 year old Grace Byrne on taking the title and well done to Jodie Moore on her great performance in reaching the her first ever final in women’s cue sports. 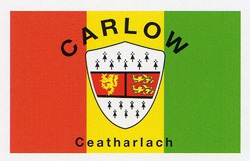 Thanks to everyone who participated and supported our second Carlow County Championship. Players cannot represent two counties, but if in the event that a player is living in one county and working in another county, it will be county of residence that will take precedence. Players who have two properties in different counties must decide which county they represent. Again its important to note that you can only represent one county at these events.